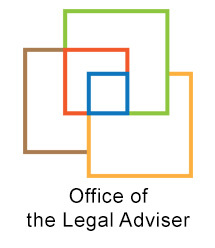 The Office of the Legal Adviser is responsible for providing sound, reliable and consistent legal advice to the ILO tripartite constituents and the Office administration, relating to the ILO Constitution, the obligations arising from membership, and the functioning of the main organs of the Organization, including the rules of procedure of all official meetings, such as the International Labour Conference, the Governing Body and Regional and sectoral meetings. The Office of the Legal Adviser is responsible for legal counselling on questions of interpretation of the basic and regulatory texts of the Organization, including the ILO Constitution and the Financial Regulations and Financial Rules. It is entrusted with similar functions in relation to the interpretation of the Statute and other basic texts of the ILO Turin Training Centre. The ILO Constitution is an international treaty which established the Organization. The original ILO Constitution was included in the 1919 Treaty of Versailles as Part XIII of that Treaty. It has since been the subject of seven amendments (1922, 1945, 1946 , 1953, 1962, 1972 and 1997). Two additional constitutional amendments (1964 and 1986) have been adopted but have not yet entered into force. To enter into force, an amendment needs to be ratified or accepted by two-thirds of member States including five of the ten Members of chief industrial importance (Brazil, China, France, Germany, India, Italy, Japan, Russian Federation, United Kingdom and United States). The Office of the Legal Adviser provides legal support at all stages of the amendment process, including ensuring the drafting quality of proposed constitutional amendments and assisting the Director-General with the discharge of depositary functions in relation to the ratification or acceptance by member States of instruments of amendment of the Constitution. The latest amendment to come into effect on 8 October 2015 was the 1997 Instrument for the Amendment of the ILO Constitution. Following its entry into force, the International Labour Conference may, acting on a proposal of the Governing Body through a majority of two-thirds of the votes cast by the delegates present, abrogate any Convention if it appears that the Convention has lost its purpose or that it no longer makes a useful contribution to attaining the objectives of the Organization. The Office of the Legal Adviser provides legal support services on all aspects relating to applications for admission to the membership of the International Labour Organization. The Information Guide on Membership to the International Labour Organization explains the procedure for becoming a member State of the ILO, as well as the basic rights and obligations arising from membership under the ILO Constitution. To date, the Organization counts 187 member States. The last two countries to join the Organization were Cook Islands and the Kingdom of Tonga on 12 June 2015 and 24 February 2016 respectively. The Office of the Legal Adviser provides legal support services to the annual session of the International Labour Conference and its different committees, as well as to the three annual sessions of the Governing Body with a view to ensuring that deliberations follow established procedural rules and practices. To this end, it is responsible for advising the officers of Conference committees and Governing Body sessions on questions of working methods and procedure, including for instance questions concerning the right to attend, the right to speak, points of order, amendment and voting procedures, as well as the duties of the chairperson. ILO member States meet annually at the International Labour Conference, the legislative assembly of the Organization. Each member State is represented by a delegation consisting at a minimum of two Government delegates, one Employer delegate, one Worker delegate, and their respective advisers. The Employer and Worker delegates must be nominated in agreement with the most representative organizations of employers and workers of the country. The ILO Constitution provides under article 17 (1) that the International Labour Conference shall regulate its own procedure. The Conference at its first Session (November 1919) adopted the first Standing Orders of the Conference, so that the delegates from forty countries present at that Session of the Conference could conduct discussions. The Standing Orders have been revised numerous times and may be further revised, as needed, by the Conference at its own initiative or upon recommendation of the Governing Body. The Conference normally establishes a Standing Orders Committee to consider the proposed amendments. The Conference appoints a Credentials Committee as one of its standing committees. The Credentials Committee is mandated, amongst other things, to examine objections regarding the nomination of employers' and workers' delegations, as well as complaints for alleged failure of governments to cover the travel and subsistence expenses of the non-governmental delegates. This function is essential as it is the only formal process within the ILO designed to ensure genuine tripartism. The Credentials Committee has functioned since the ILO’s inception and as a result has developed a significant "jurisprudence" in matters of representativeness of industrial organizations and the scope of the obligation to consult the most representative employers' and workers' organizations based on a landmark advisory opinion delivered by the Permanent Court of International Justice in 1922. The Office of the Legal Adviser provides the secretariat of the Credentials Committee and, as part of this work, receives and processes the credentials and oversees certain aspects of the process of registration of delegates. The Governing Body is the executive organ of the Organization. Pursuant to article 7 (8) of the ILO Constitution, the Governing Body regulates its own procedure. At its 294th Session (November 2005), the Governing Body approved the Compendium of rules applicable to the Governing Body of the International Labour Office that is a consolidation into a single document of the rules governing its operation. The Introductory note and Standing Orders of the Compendium were last amended in March 2016, Annexes I-VIII were last amended in December 2014. The Office of the Legal Adviser provides legal support services to Regional Meetings, Sectoral Meetings, meetings of experts and global dialogue fora convened by the Governing Body as well as other official meetings, such as the meetings of the Joint Maritime Commission, the Special Tripartite Committee established for the Maritime Labour Convention, 2006 or the recently established Standards Review Mechanism Tripartite Working Group. It assists the officers of those meetings so as to ensure that the debates and decisions of those bodies are consistent with the applicable Rules, Standing Orders and established practices. Regional Meetings are convened pursuant to article 38 (1) of the ILO Constitution. In principle, a Regional Meeting is held each year in one of the four regions according to the following order: Asia and the Pacific (which includes the Arab States), the Americas, Africa and Europe. The powers, functions and procedures for Regional Meetings are governed by rules drawn up by the Governing Body and approved by the International Labour Conference. The current Rules for Regional Meetings were adopted by the Governing Body at its 332nd Session (March 2018) and confirmed by the International Labour Conference at its 107th Session (May-June 2018). The Office of the Legal Adviser is responsible, inter alia, for ensuring that an agreement is concluded with the government of the host State that offers adequate protection to the tripartite participants of the meeting, and the members of its secretariat. It also has the same duties and responsibilities in matters of accreditation and servicing the Credentials Committee as those assumed during the annual Conference. The Standing Orders of Sectoral Meetings were adopted by the Governing Body at its 264th Session (November 1995). They are not intended to apply to meetings of experts, symposia or seminars, which currently operate without formal standing orders. The Standing Orders of the Joint Maritime Commission (JMC) were adopted by the Governing Body at its 107th Session (December 1948) and have been amended on numerous occasions. The Standing Orders of the Special Tripartite Committee (STC) established under Article XIII of the Maritime Labour Convention, 2006 were adopted by the Governing Body at its 313th Session (March 2012). The Standards Review Mechanism Tripartite Working Group operates since February 2016 under the Terms of reference adopted by the Governing Body at its 325th session (October 2015) but no rules of procedure have as yet been adopted.